SID stands for static-impeller driven, which means the pump contains an electronic driver or motor that has no moving parts but simply spins on a magnetic field. The magnetic field grasps the impeller and visibly spins it without any moving parts or seals. As a result, it's extremely long-lived without much power consumption. These pumps are completely stainless steel, so they don't corrode. The El SID pumps have no seals which can leak, and no bearings to get hot or brushes to spark - they are explosion proof. A 10-Watt driver used for domestic solar hot water and 24 hour instant hot water in large homes. Requires a 10watt Crystalline module or larger such as BP SX10M. It is rated for 3.3gpm and can be used in open loop water systems with up to three 4x10 solar collectors or in closed loop antifreeze systems with up to two 4x10 solar collectors. This pump is used to circulate the water throughout the radiant panel or other hot water heat emitting system. 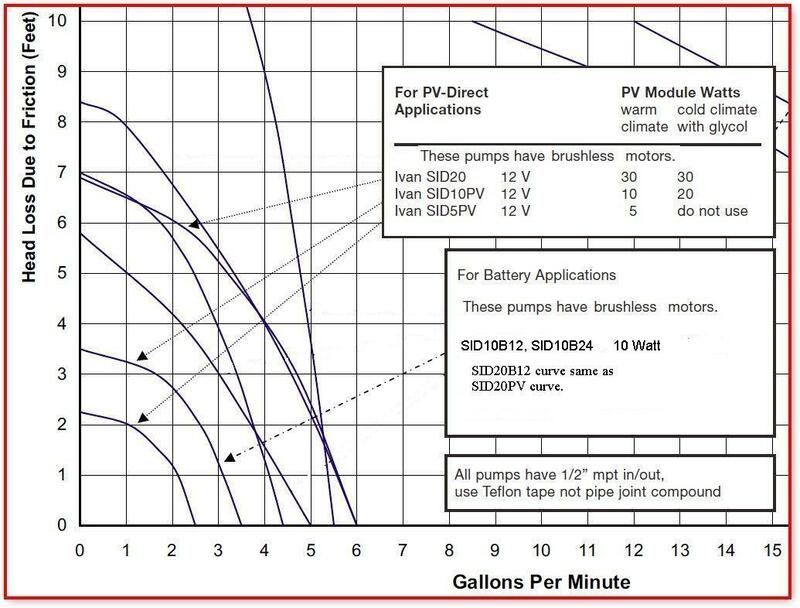 • Use a small, inexpensive PV module (photovoltaic panel) to power the pump. No battery or electronic controller is used. There is no wiring to the building's electric system. • Sun-synchronous operation: pump speed varies with sunlight, corresponding to the available heat in the collector•natural automation! • This principle has proven highly reliable in solar water heaters since the early 1980's. Four red LEDs will glow when the impeller is spinning. Two will light if the impeller is stuck, one above and one below. • High temperature - 250•F fluid max. Shown is 1/2" female NPT adapters and 1/2" pipe. Also shown are the heads of four Philips screws that fasten the 2W2 driver onto the head. Four common screw heads are shown, holding the stainless steel fluid retaining plate in place. Also shown are four screws coming from the back of the pump head. When the 2W2 driver is in place, a total of eight screws squeeze the fluid retaining plate in place. Note that there is no shaft and [of course] no shaft-seal. The crown at the center of the retaining plate houses an eight pole ceramic magnet. Thus, the rotating magnetic field in the 2W2 driver is coupled to the impeller, which resides in the fluid. The•stainless steel•pump is soldered into your copper plumbing, and the driver screws on top of it. Any driver [regardless of size] can be interchanged on the same pump, which means that if the pump doesn't provide the flow you need, you can install a larger driver within a couple of minutes. Product Manufacturer: Ivan labs, Inc.